Get a first listen of Honeyrude's debut album. 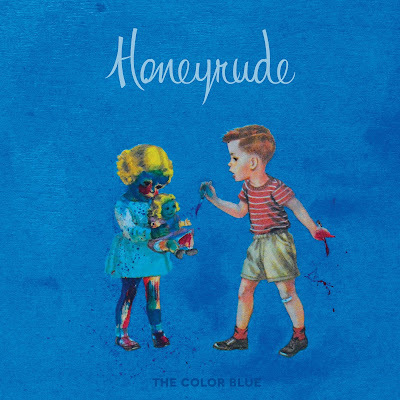 Austin-based Honeyrude's debut full-length The Color Blue is a record that treats vulnerability as a constant. They breath life into the poppier side of nineties indie rock, with the soft grunge sheen of Babes in Toyland and echoes of the shoegaze rockers of Lush. The music forces itself into rigid shapes; the lyrics are boldly declarative, fueling desire and fury, with irritation and loneliness coursing through each song. Vocalist Jess Ledbetter has a curious range. She possesses a low, clear expressive voice that evocatively communicates tender-hearted vulnerability. The opening track “Something about Milwaukee” combines Courtney Love’s dynamic vocals with an infectious and slow-building hazy guitars. Guitarist Ian Lund's and bassist Billy Kunath's hooks snap into tight, rhythmic grids and tones that add vibrant color while staying within the proverbial lines. Ledbetter switches up her style here and there such as on “Ring, Ring, Ring,” bringing out a seldom utilized sweetness while exposing her needs, insecurities, and fears. It’s a lovesick song that lifts into arching lines as her vocals ring out, “I’m walking through field’s of your word’s in your mind / I’m dreaming of deserts where our hearts aline.” Ledbetter’s vocals drip genuine, regretful emotions as she sings, “Just so you know / I thought of you / And if time allows your heart to heal.” Her words are indicative of the all too common occurrence of love and loss. Ledbetter embraces more personal sentiments on ballads like “Lover in Denial,” floating delightfully between dream pop and bedroom rock. Beefed up chords of guitar give way to leads clear as day, that simultaneously lift your head and pull at your heartstrings. By the end of the album, with the slow Cocteau Twins-esque drone of “Falling Backwards,” Ledbetter's sass deepens into something more bruised and wistful, as love escapes her once again. If you have a beating heart, you’ve probably been there, and maybe that’s why Honeyrude manages to twist you from inside. "The Color Blue has been a long road for all of us - "Ring, Ring, Ring" was first conceived in 1998 by Ian for his girlfriend at the time and came to its existing structure 2 years ago when I joined the band and wrote the lyrics and melody. "Something About Milwaukee" was written the beginning of this year, inspired by Swervedriver's new record. The songs are undeniably nostalgic and I am really touched by the way it all came together and elated that it exists on vinyl. Records are like tattoos for me, they represent something you don't want to forget, regardless of who you become." Listen to Honeyrude on bandcamp. Abbie Jones, who will sing along to every Liz Phair song at karaoke by heart and is always down to get milkshakes past midnight. When she isn't writing about music, she is playing drums in her band or hosting shows in her backyard.